Knowing what your costs are before signing on to use any services is a great idea. This is especially true with Skype as there a lot of misconceptions that exist about how much Skype costs. That’s because Skype is not your traditional voice service. Skype is more than that. Sure, Skype was originally intended to be a way for users to make free calls over the Internet to other users, but over time, Skype has evolved to become a robust communications service offering instant messaging, SMS, and video collaboration. There are generally (2) plans available for Skype for Business: $2/mo. per user with an annual committment, or $5.50/mo. per user with an annual committment. Additional licenses may be required in order to access all of the features of Skype for Business. Check out the licensing guide here , under the Server 2015 column, for more information. Each plan has a variety of different features, which you can compare here , so it really all depends on what you need. 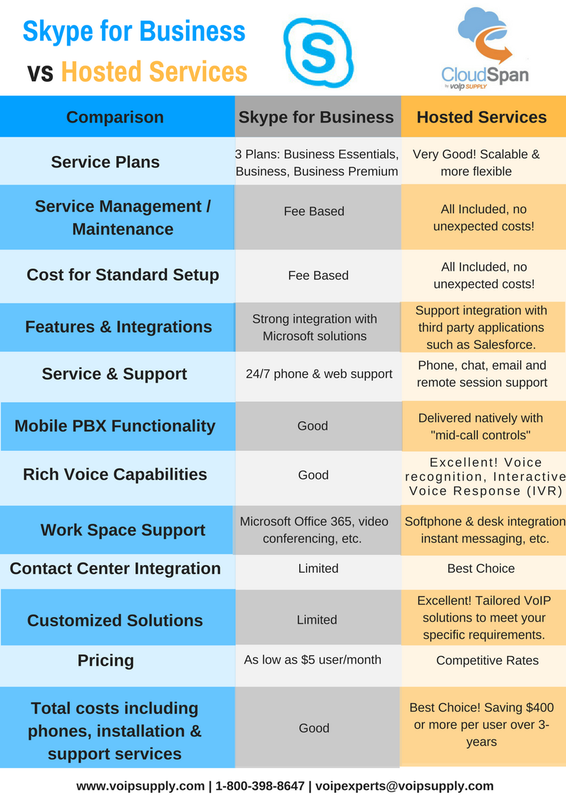 There is another cost perspective of Skype that many people forget as well: Now that you're using Skype (Free Edition) or even Skype for Business, do you know what hardware you may need to be able to fully utilize the features of Skype? We encourage you to reveiw some of the Skype Hardware that may be necessary to accommodate your Skype solution. Skype is a free software download. Anyone with a compatible PC, laptop or mobile phone can download and install Skype for free . All calls between Skype users are completely free. Make one call or make 1,000 calls - it doesn’t matter. Neither does geography. This makes it great for calling your crazy cousin Eddie in Kansas. Calls to and from landlines, VoIP cloud services and cell phones are not free with Skype . Through Skype you can purchase a number of low cost calling plans to make calls within certain geographies or worldwide. For example Skype offers an unlimited monthly calling plan (including a Skype number) to US and Canada for just $2.95 per month. This makes Skype affordable for just about anyone. With Skype you can send and receive SMS messages (if you have a Skype phone number). You can send these SMS messages to other Skype users and cell phones through the world. Sending and receiving SMS messages via Skype is not free. Prices for SMS messages vary based on the destination of the message, but share at just under five cents ($0.05) per message. Today you can use Skype to make video calls to any other Skype user. This, like Skype to Skype voice calls, is completely free. At this time you cannot call other video calling users. Depending on who you are, who you call and how much you do it, Skype can either be free or almost free (when compared with similar services). Given the features, functionality and wide variety of ways that you can communicate using Skype the cost of getting a Skype phone number and monthly calling plan is down-right cheap. But like anything you will have to make the decision for yourself as to whether the value Skype brings to the table is worth what they charge.